Classic high back style with tweedy upholstery. Robyn has lots to offer for family home or smart apartment. Robyn is a classic high back sofa. Soft to touch, the tweedy upholstery has subtle shots of colour that tone with the rich velvet scatter cushions. Dark wooden legs raise the comfortably upholstered style from the floor, lightening the overall look. Arms are shaped into a soft curve to lean into, and have additional self-coloured bolsters. This range is made for nesting. 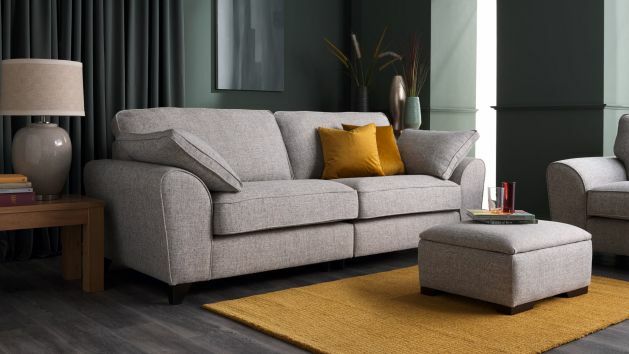 The Robyn collection has sofas to seat four, three or two, an armchair and storage footstool. The two seater is also available as a deluxe sofa bed. Robyn is a versatile set with lots to offer in a family home, or smart apartment.